This is the voyage of the spaceship Laika. Its current mission: to travel to a new world, to survive without human companions and opposable thumbs, to boldly go where no dog has gone before! When the four members of the canine crew of the Laika wake from hibernation to find themselves abandoned by their human counterparts, they know it’s up to them to complete the mission. And good dogs always complete their missions. The Secret Life of Dogs meets Up meets Lost in Space, or perhaps the canine version of The Martian. Discover what it’s like to be a dog, how dogs came to exist in the first place, and the bond dogs share with their human companions. Read about heroic historical canines. And best of all, learn about space travel from the perspective of a future bred-to-be-really-smart dog. A really good dog. A Barkonaut! A howling good read for the middle grader in your life. Dogs in space! 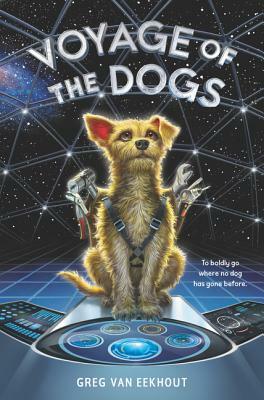 Share this book with middle graders who enjoy stories about dogs, space adventures, or action adventure stories—or all three! Lopside is a Barkonaut, a specially trained dog who assists human astronauts on missions in space. He and the crew aboard the spaceship Laika are en route to set up an outpost on a distant planet. When the mission takes a disastrous turn, the Barkonauts on board suddenly find themselves completely alone on their severely damaged ship. Survival seems impossible. But these dogs are Barkonauts—and Barkonauts always complete their mission. SOS. Ship damaged. Human crew missing. We are the dogs. We are alone. Greg van Eekhout lives in San Diego, California, with his astronomy/physics professor wife and two dogs. He’s worked as an educational software developer, ice-cream scooper, part-time college instructor, and telemarketer. Being a writer is the only job he’s ever actually liked. You can find more about Greg at his website: www.writingandsnacks.com.